SharePoint Permissions - Access for everyone? 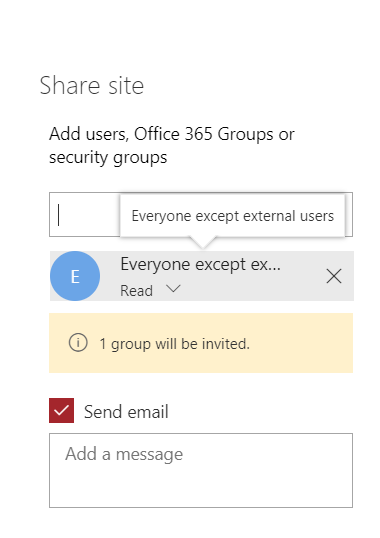 There is literally an "Everyone" principal in SharePoint Online that you can share your sites with. There is also "Everyone except External Users" which would exclude external users. Important: uncheck the "send mail" checkbox before clicking Share or you will end up spamming the entire org. Not the answer you're looking for? Browse other questions tagged sharepoint-online permissions or ask your own question.